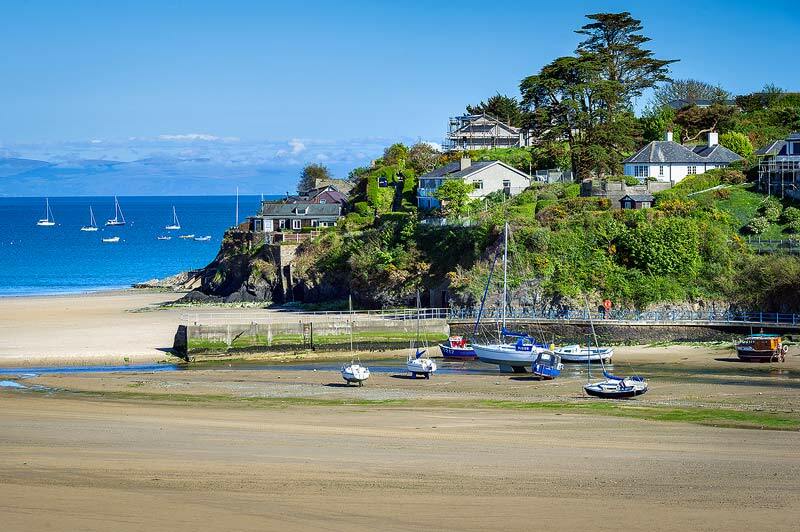 Guest photographer Phill Boyd is back on duty this week and the weather has kindly obliged by providing some glorious blue skies and a little taste of summer. 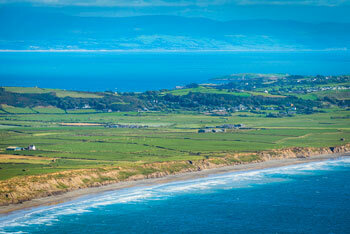 This shot is taken from the cliffs above Porth Neigwl (Hell's Mouth), where you can see a few lines of swell rolling in. The photo was taken on 11/04/2019 and it was uploaded on this page on 14/04/2019. 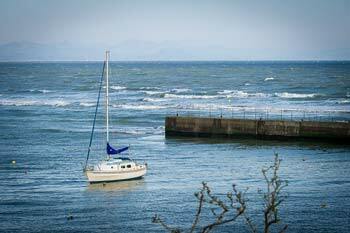 A beautiful spring morning with a light easterly breeze chopping up the bay, is this week's photo from John. 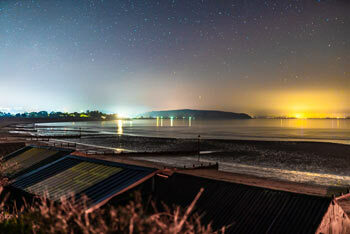 The shot was taken at the popular Aqua bar on the beach at Llanbedrog. The photo was taken on 07/04/2019 and it was uploaded on this page on 07/04/2019. Some pleasant weather for the start of the last weekend in March. 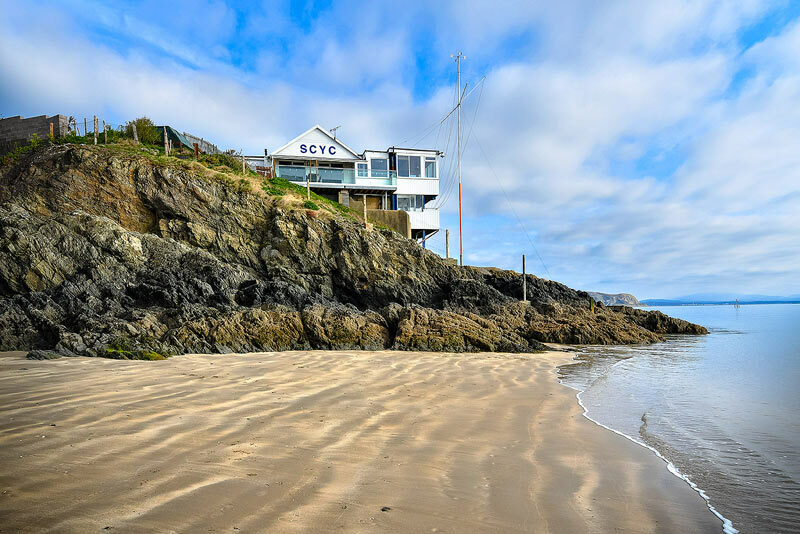 John captured the quiet water, the lovely pattern in the sand and emerging blue skies on this shot of the SCYC facilities on the headland at the northern end of Abersoch main beach. 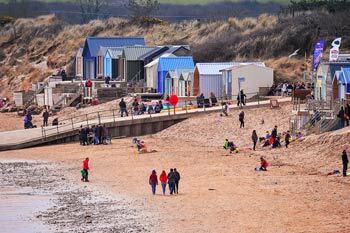 The photo was taken on 30/03/2019 and it was uploaded on this page on 30/03/2019. 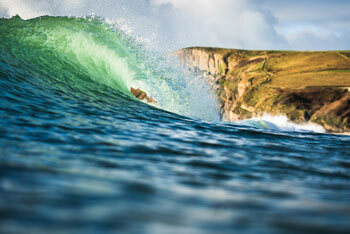 Phill Boyd is back behind the lens this week and what a shot from the talented chef, surfer and photograher!!! 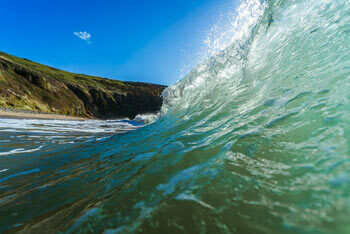 This was taken in the waves at Porth Ceiriad, on a sparkling day of weather for the Llyn Peninsula. The photo was taken on 24/03/2019 and it was uploaded on this page on 24/03/2019. 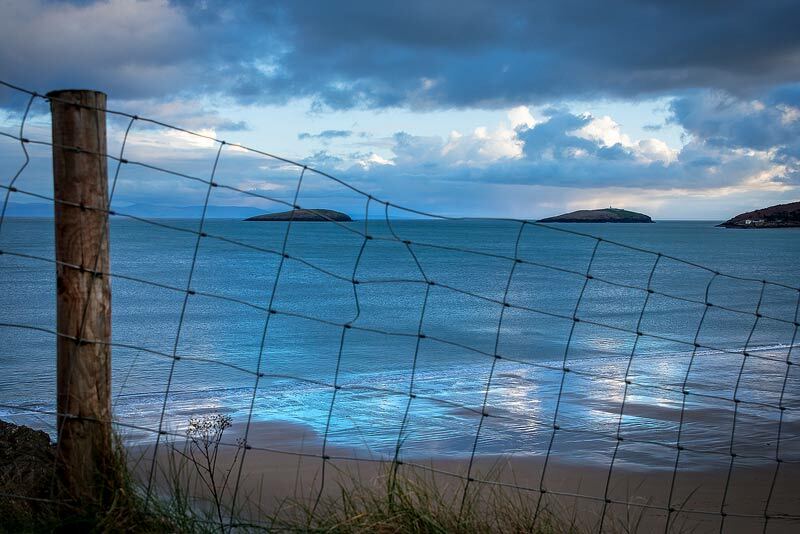 A view across the bay is this week's photo from John, taken from the road from Abersoch to Llanengan. Swell can be seen hitting the islands. 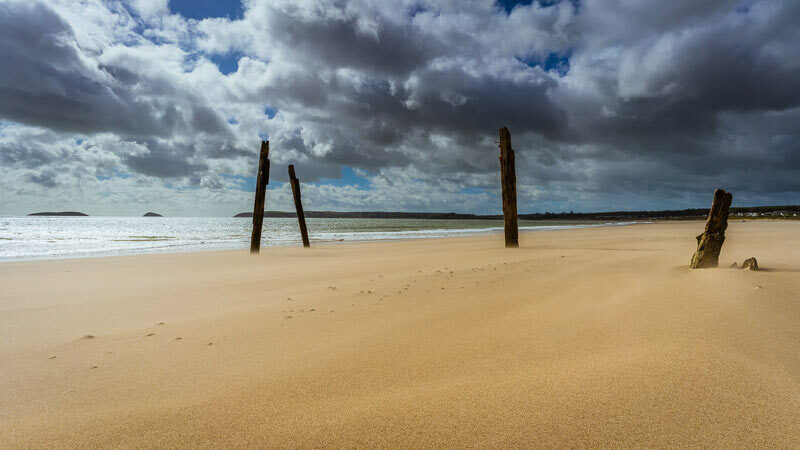 The photo was taken on 17/03/2019 and it was uploaded on this page on 14/03/2019. Bright and breezy conditions for this week's shot from John, looking across the bay to the islands, from the quarry end of the Warren beach., with Abersoch in the far distance. 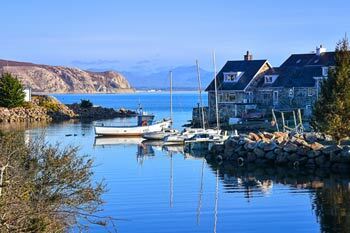 The photo was taken on 05/03/2019 and it was uploaded on this page on 10/03/2019. 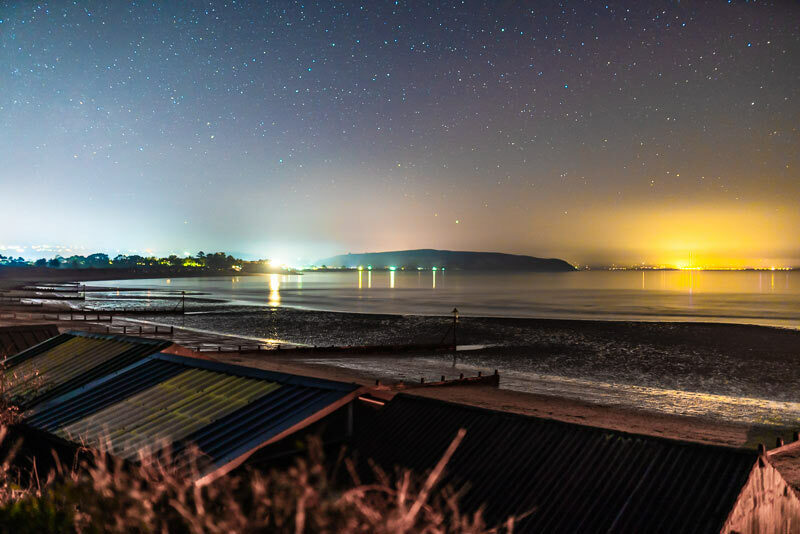 Guest photographer, chef and local surfer Phill Boyd is back this week and has taken this wonderful shot of a starry sky over Abersoch - taken from the Machros end of Abersoch main beach. The photo was taken on 27/02/2019 and it was uploaded on this page on 03/03/2019. 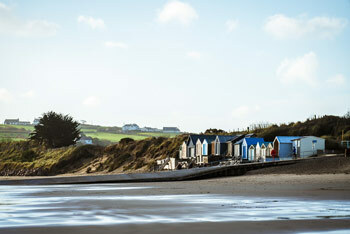 A view looking up (or down) Abersoch main beach again this week, on a beautiful spring-like Friday afternoon, when the breeze from the south-east dropped enough to bring some pleasantly warm conditions. 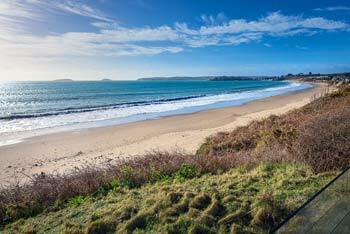 The main beach can be a real sun trap, even in winter, with some warmth possible when that wind drops out. 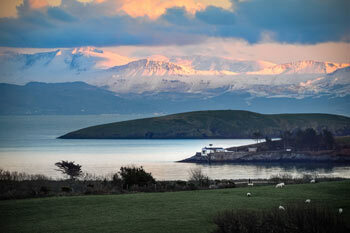 The mountains of Snowdonia can be seen in the far distance across the bay. The photo was taken on 22/02/2019 and it was uploaded on this page on 23/02/2019. 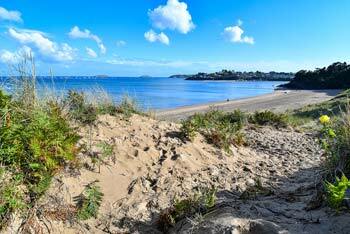 Some decent weather for this week's photo from John, taken looking north along Abersoch main beach. 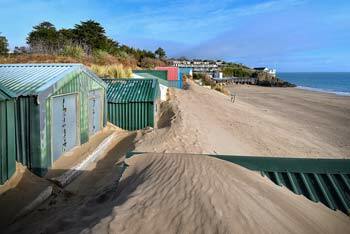 The sand is blown into drifts around the beach huts in the winter, a bit like snow. 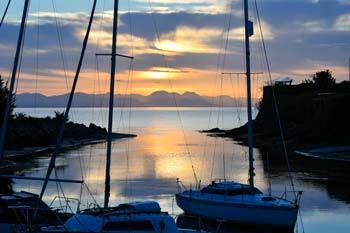 In the distance can be seen Bennar headland, with SCYC sitting just above the water. The photo was taken on 16/02/2019 and it was uploaded on this page on 16/02/2019. The photo was taken on 08/02/2019 and it was uploaded on this page on 09/02/2019. 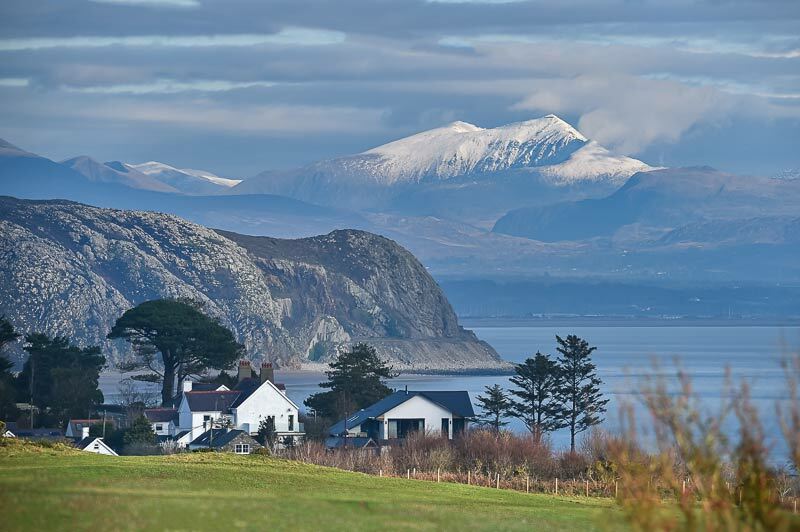 Another wintry scene this week from John, looking across the bay and islands towards the snow covered mountains of the Snowdonia National Park. 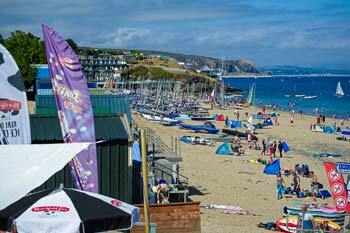 The old lifeboat station can be clearly seen in the foreground. The photo was taken on 30/01/2019 and it was uploaded on this page on 02/02/2019. A touch of winter for the mountains of Snowdonia this week and there may be a bit more of the same as we head into the last few days of January. John captured this classic view of the summit of Snowdon from Abersoch, with Llanbedrog Head in the middle of the photo. The photo was taken on 20/01/2019 and it was uploaded on this page on 26/01/2019. Guest photographer, chef and surfer Phill Boyd has provided this week's photo and what a great one it is - taken during the last few days, in the water, of a breaking wave at Porth Ceiriad. 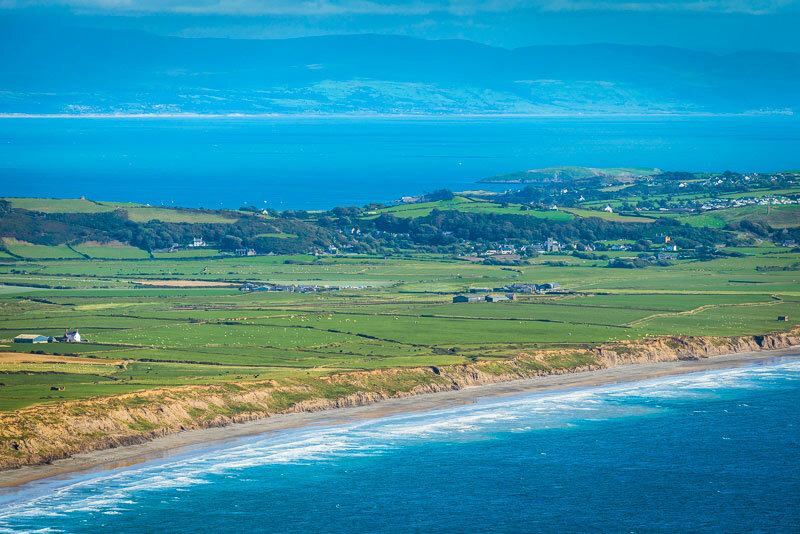 The local surfers can be seen in the water at any time of year! 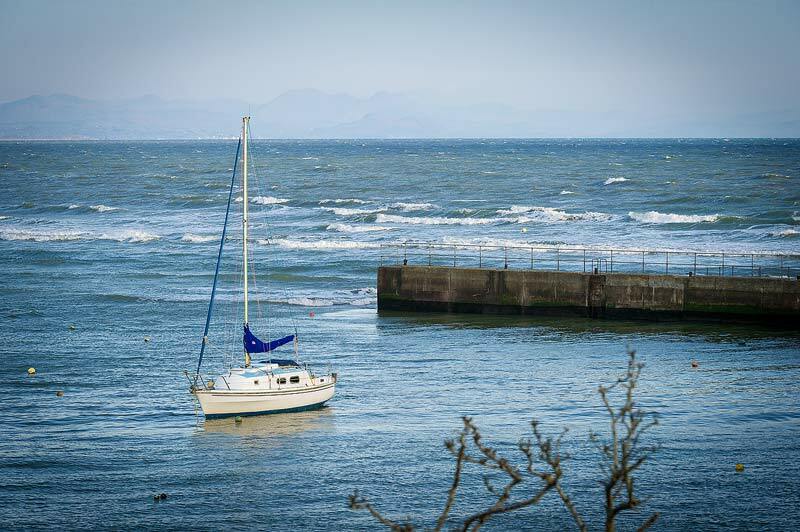 A classic view this week from John, looking across the inner harbour with Llanbedrog headland and Snowdon in the background. 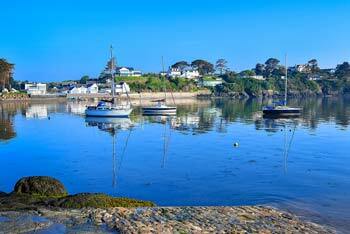 The house next to the water, Harbour Cottage is available to rent as a holiday let - what a location that is! The photo was taken on 09/01/2019 and it was uploaded on this page on 12/01/2019. 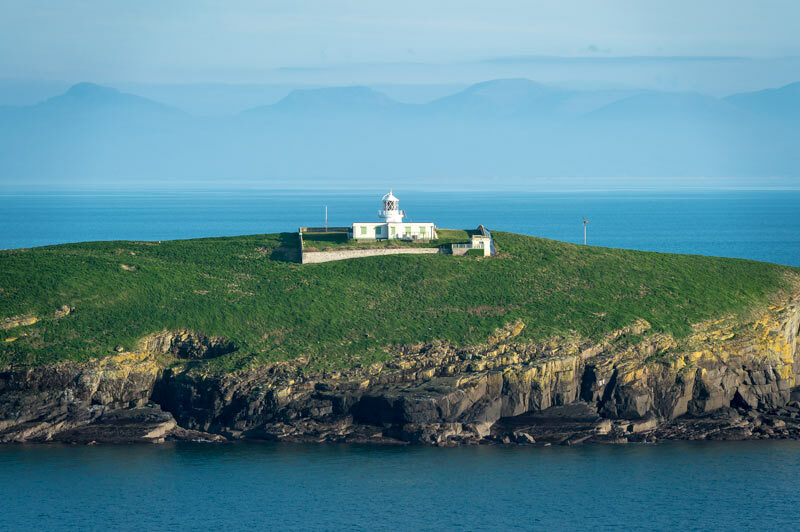 The first update of 2019 and John is back with a telephoto shot of St. Tudwal's West Island and its lighthouse, which is home to a global celebrity during the summer months - Bear Grylls! 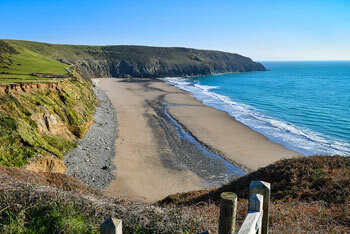 The shot was taken from the coastal path which provides many similarly spectacular views. The photo was taken on 04/01/2019 and it was uploaded on this page on 05/01/2019. 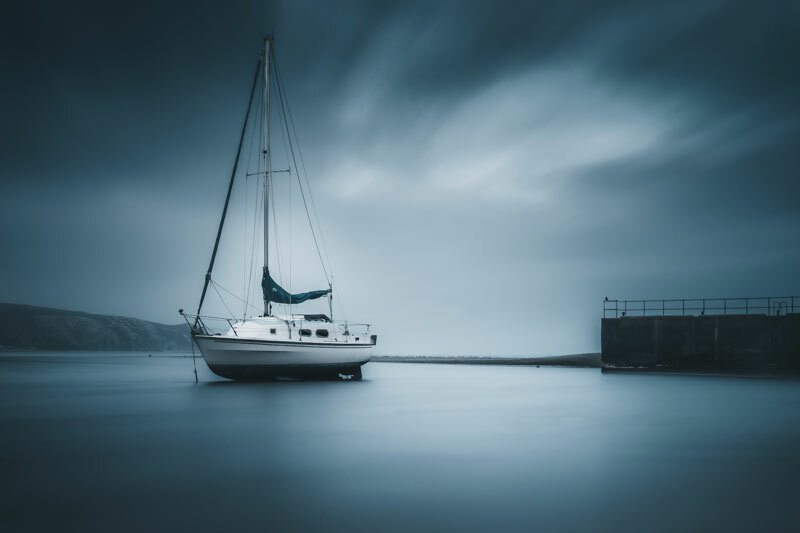 John is away for this week's photo and it is not our normal stand in Phill who has provided the photo, but Phill's talented brother Alex, who captured this atmospheric shot of the same yacht that we featured a couple of weeks ago. 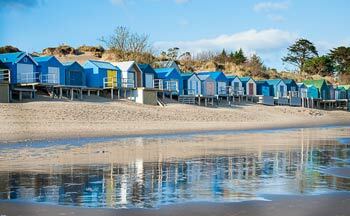 The skies have been grey over the holiday period in Abersoch, which does bring the opportunity for great photography! 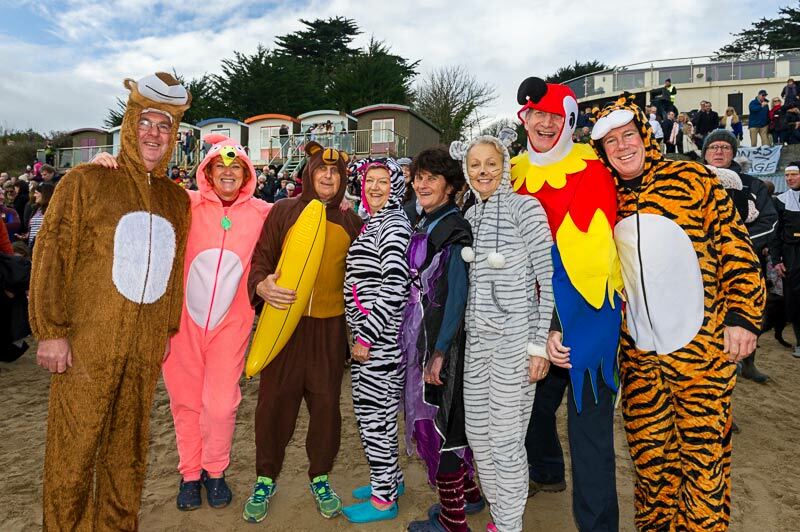 The photo was taken on 26/12/2018 and it was uploaded on this page on 30/12/2018. 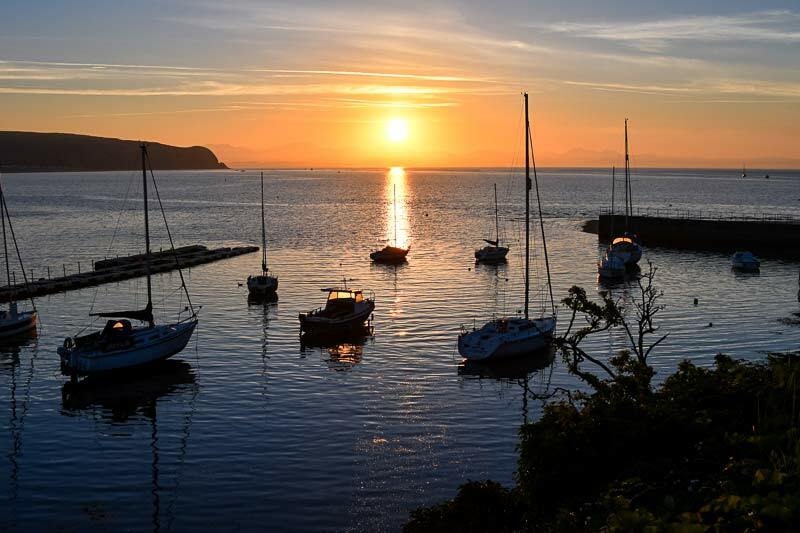 A lovely photo this week taken from SC Yacht Club in Abersoch and looking towards the Islands of St. Tudwal's, with the rising sun as a backdrop. 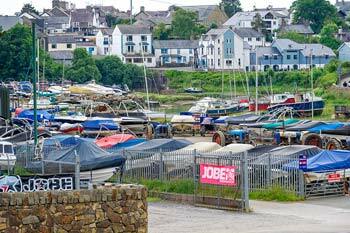 The tide is high on this photo as the yacht club jetty is covered by the sea. 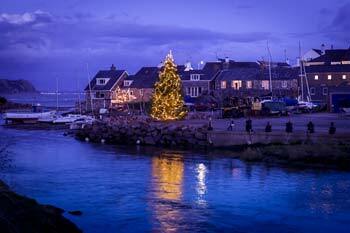 As this photo will be on the site on Christmas Day, we would like to wish all our readers a very Merry Christmas. 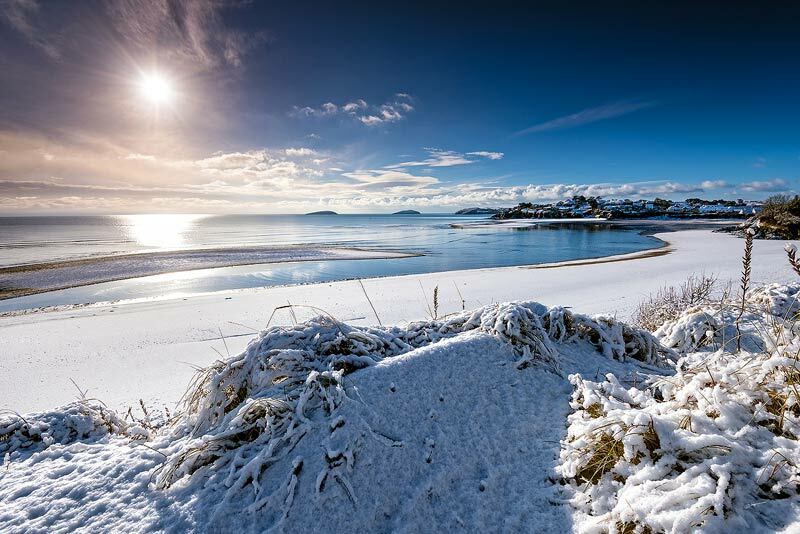 The photo was taken on 22/12/2018 and it was uploaded on this page on 23/12/2018. 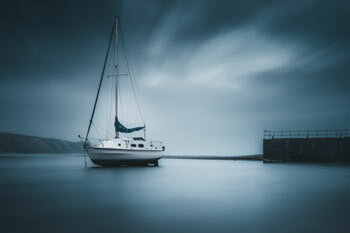 John is back this week and during the recent spell of cold, southeasterly winds, took ths shot of a yacht at anchor in the shelter of the outer harbour, with the choppy seas of the bay in the background. 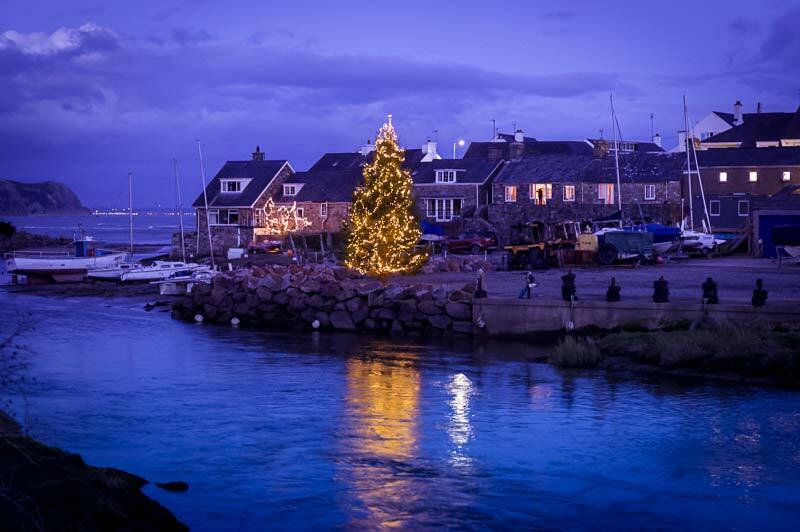 It is the annual Christmas Festival Weekend in Abersoch and despite the storms during the week, the Christmas tree was finally decorated and looks really rather nice! Well done to Fritz, Tim, Rob and all involved in bringing a bit of Christmas cheer as you enter the village. The photo was taken on 30/11/2018 and it was uploaded on this page on 01/12/2018. 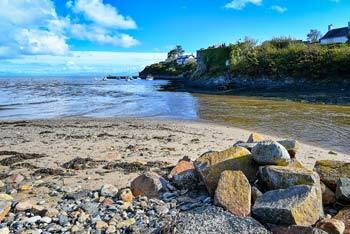 One of the gems of the Pen Llyn and Abersoch areas is the beach at Porth Ceiriad, which is often quiet through much of the year. 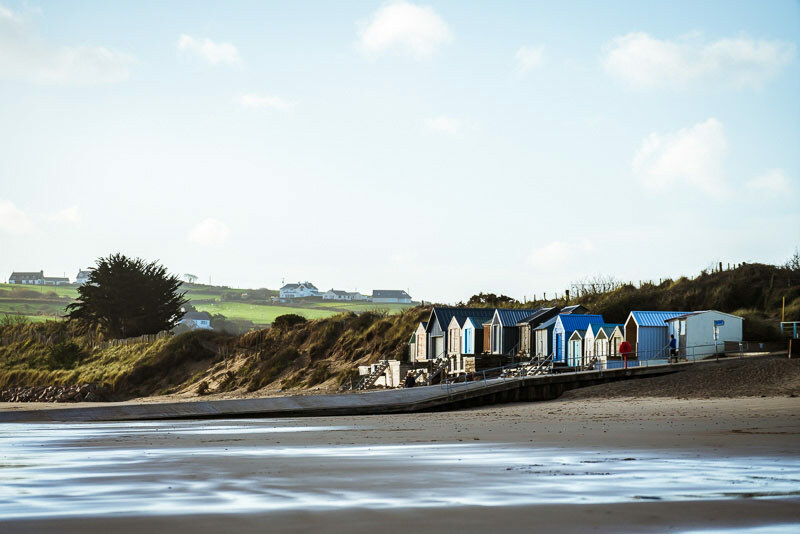 A popular place for surfers all year round, the beach lies on the Wales Coastal Path - so is in fairly easy reach from Abersoch for those who like walking and hiking. The views along the path between Abersoch and this bay are spectacular. The photo was taken on 22/11/2018 and it was uploaded on this page on 24/11/2018. John is back behind the lens in Abersoch this week and captured a beautiful sunrise in the bay. 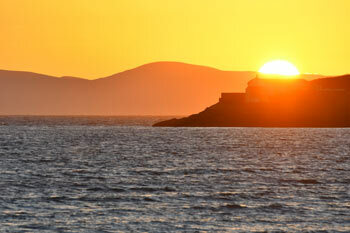 The sun is rising above the old lifeboat station at Penryn Du, with a slight chop on the water from an easterly breeze. 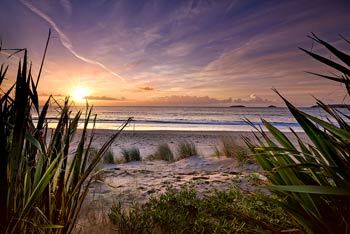 The photo was taken on 15/11/2018 and it was uploaded on this page on 17/11/2018. The talented Phill Boyd is back with us this week as John's stand in and he captured this shot on a blustery afternoon, from the beach opposite the Fach caravan park. 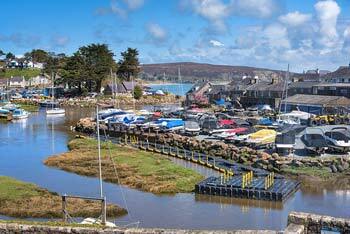 Heavy rain brings the brown colour to the water due to the volume of water entering the harbour from the Afon Soch. The photo was taken on 09/11/2018 and it was uploaded on this page on 11/11/2018. 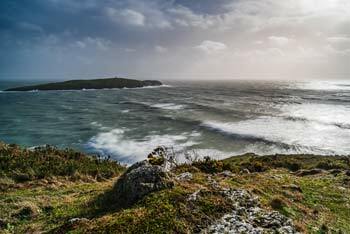 A trip to Porth Neigwl by John, with the weather gradually closing in from the west, brought this lovely shot, taken from one of the old buildings that are not too far away from the receding cliffs. The continuous erosion of the cliffs at this beach are caused by a mixture of elements, with the rain and wind playing their part, as well, of course, the sea. The photo was taken on 02/11/2018 and it was uploaded on this page on 03/11/2018. 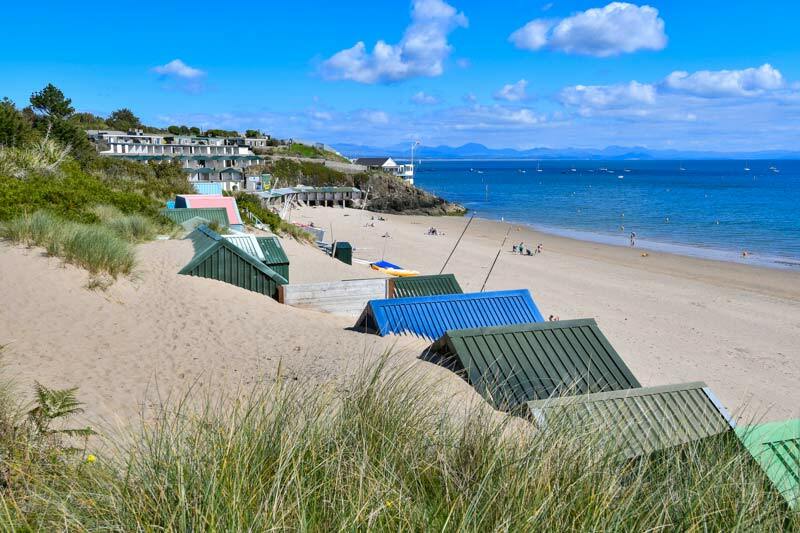 Cold northerly winds brought hail showers to Abersoch and John captured this image, taken from the main beach, of 2 showers in the distance, running down the west coast of Wales in the northerly airflow. The photo was taken on 27/10/2018 and it was uploaded on this page on 28/10/2018. 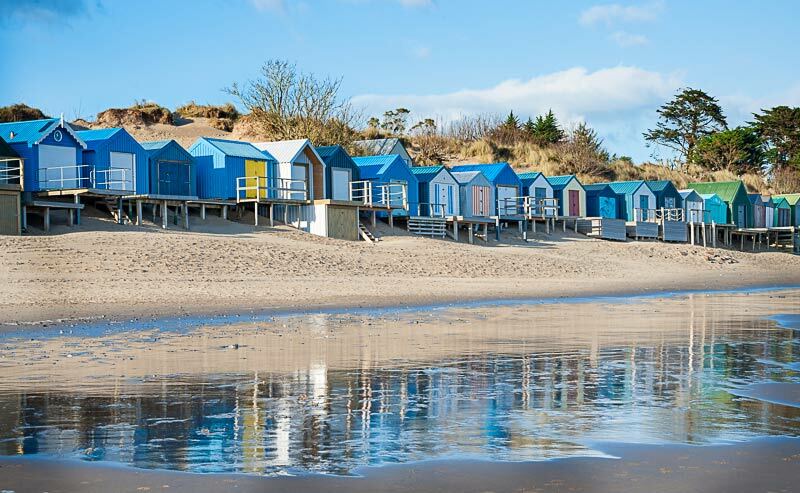 A fine and dry start to the working week in Abersoch enabled John to get this shot of some of the beach huts on the main beach. It does look as though some colder weather may arrive at the end of the week, which we'll be keeping a close eye on, over on the weather page. The photo was taken on 22/10/2018 and it was uploaded on this page on 22/10/2018. 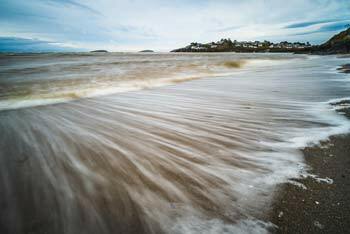 We welcome John back this week for the weekly photo and he has taken this shot of a very full River Soch, after the torrential rain associated with Storm Callum and its aftermath. 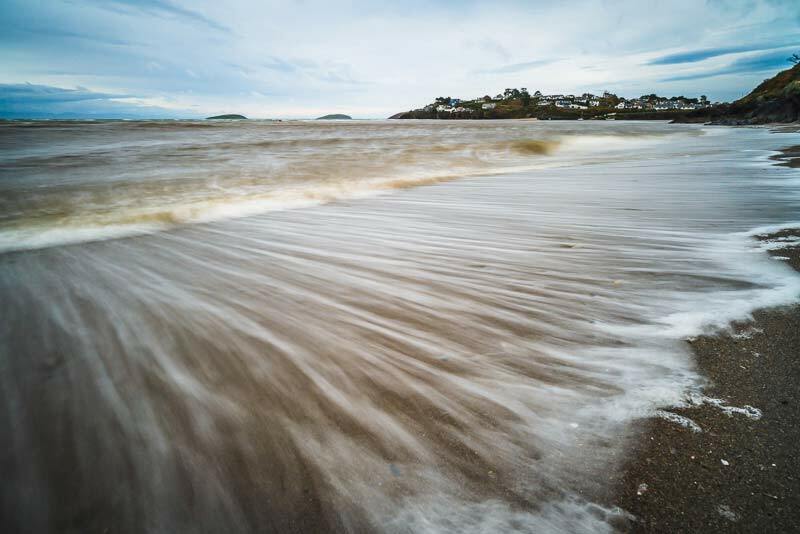 Parts of Wales got a real deluge and although Abersoch did not see the extreme totals of rain that were seen in parts of mid and south Wales, it was still a very, very wet period, along with some very strong winds. 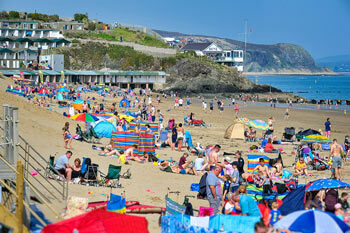 As the photo shows, brighter and drier weather has returned today. The photo was taken on 14/10/2018 and it was uploaded on this page on 14/10/2018. 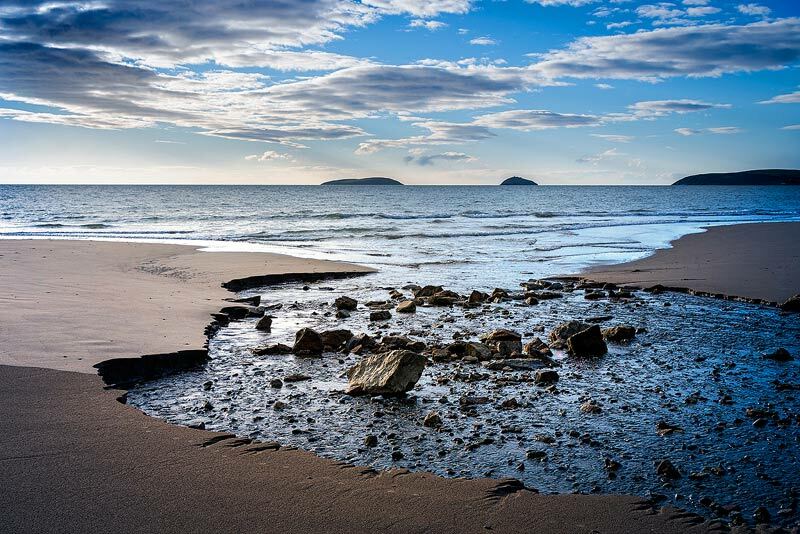 John's stand in, Phill Boyd is back again this week with another cracking photo taken whilst on a walk around the wonderful Llanbedrog headland. 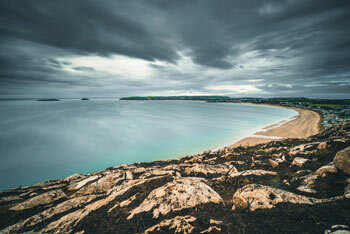 This view, taken on a breezy day, is looking up the Warren beach with Abersoch in the distance. The photo was taken on 05/10/2018 and it was uploaded on this page on 06/10/2018. 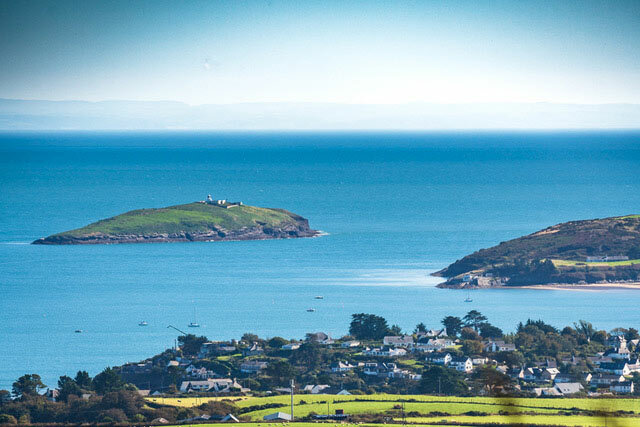 Phill is still with us this week and snapped this lovely shot from the high ground of Mynytho, looking down towards Abersoch and St.Tudwal's West Island, with its lighthouse. The photo was taken on 27/09/2018 and it was uploaded on this page on 29/09/2018. 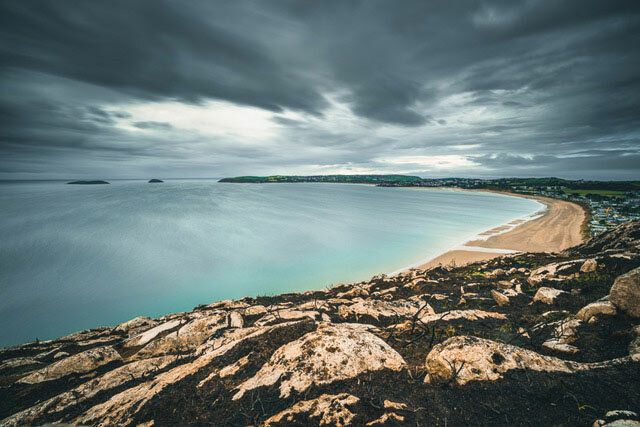 Another one from Phill this week - this one taken on a breezy day down at the Quarry beach, looking back towards Abersoch and St. Tudwal's Islands. The photo was taken on 21/09/2018 and it was uploaded on this page on 23/09/2018. The photo was taken on 13/09/2018 and it was uploaded on this page on 15/09/2018. 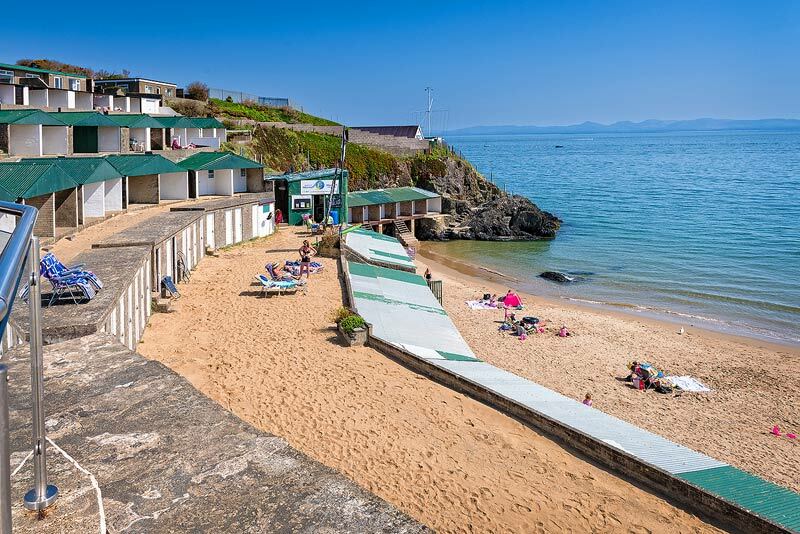 The first half of last week saw some long sunny periods in Abersoch, with a cool northerly breeze and great visibility across the bay and overhead overnight too. John made the most of the clear spell to get this shot from behind the beach huts on Abersoch main beach. The photo was taken on 05/09/2018 and it was uploaded on this page on 08/09/2018. Blue skies on the last day of August were captured by John with a shot from the popular Zinc, looking across Tim's Boatyard. The photo was taken on 31/08/2018 and it was uploaded on this page on 03/09/2018. The changeable second half of the summer has continued in Abersoch, with John taking this lovely shot on one of the better afternoons, with a view from the dunes at the southern end of the Warren beach, looking back across towards Abersoch and St. Tudwal's Islands. 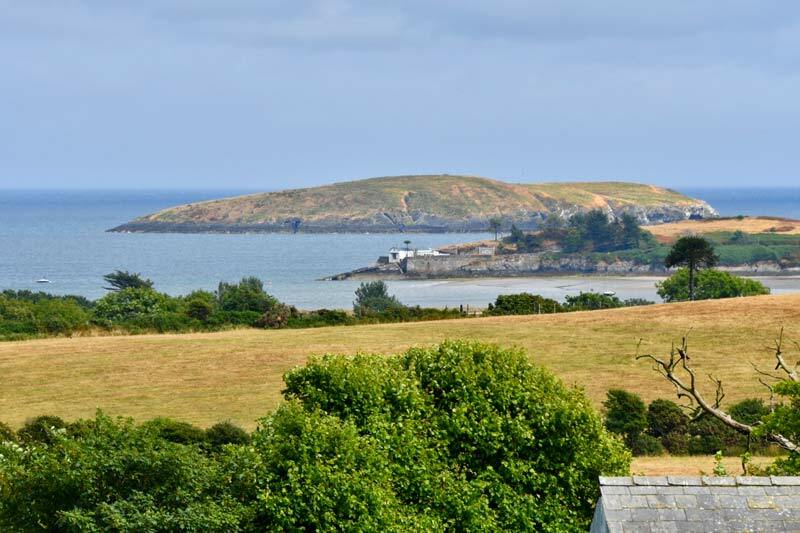 The photo was taken on 23/08/2018 and it was uploaded on this page on 26/08/2018. 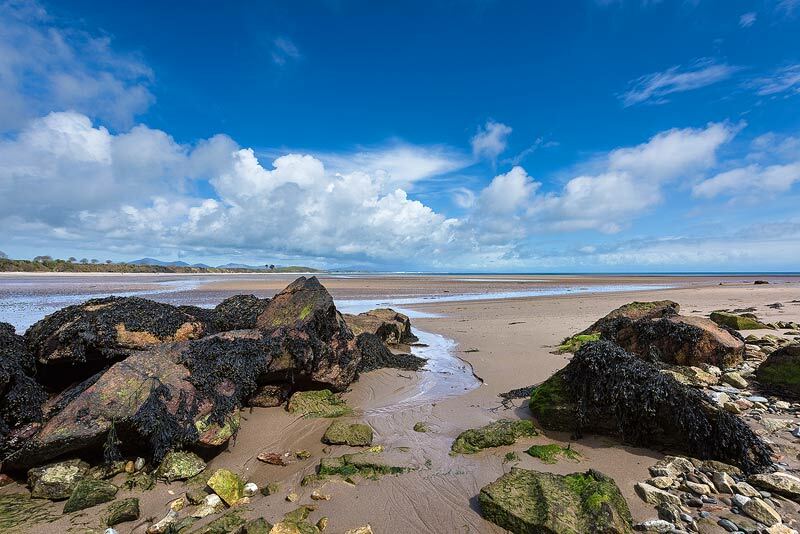 A mixed bag of weather this week in Abersoch and we saw a couple of really nice afternoons, one of which was captured by John, with this view from the Bwlchtocyn end of the beach, looking back towards the headlands of Abersoch and Llanbedrog. The photo was taken on 16/08/2018 and it was uploaded on this page on 18/08/2018. Before the unsettled weather of this weekend, the sun was out at the end of last week, with this week's photo from John capturing the blues skies with, a view looking across the sand of the harbour beach, Abersoch. The photo was taken on 10/08/2018 and it was uploaded on this page on 12/08/2018. 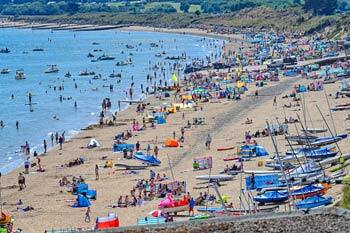 A busy Sunday on Abersoch main beach is this weeks photo from the lens of John Wormald. 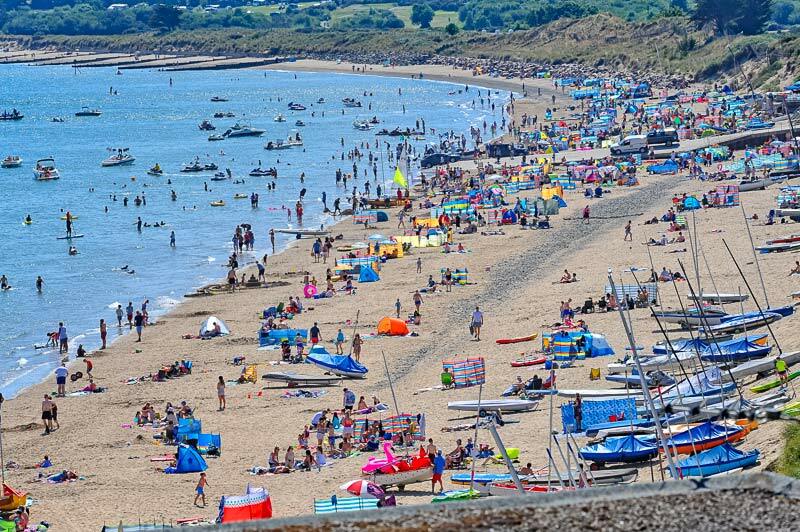 Really warm temperatures, strong sunshine and light breezes combined to bring a near perfect Pen Llyn beach day - one of many since early May. The photo was taken on 05/08/2018 and it was uploaded on this page on 06/08/2018. Clear blue skies over Abersoch during this week, captured by John from near to the Tal y Fan site, next to the Warren. St. Tudwal's West Island can be seen, the summer home of Bear Grylls. 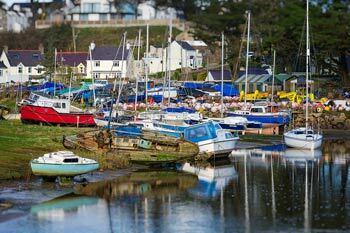 Unfortunately the weather has deteriorated since the beautiful weather of Thursday, but there are expectations of the settled weather returning late next week. The photo was taken on 25/07/2018 and it was uploaded on this page on 29/07/2018. A view from John looking across the beach from the middle slipway towards the many dinghies of the annual Abersoch dinghy week. There are various classes of sailing dinghies here this week, battling it out on some of the best and most picturesque sailing waters in Britain. The photo was taken on 22/07/2018 and it was uploaded on this page on 23/07/2018. 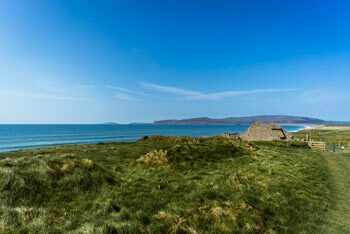 A view across the bay showing the scorched grass from the long fine and dry spell. Today has seen the most meaningful rain since late May, however, the skies cleared long enough for John to get this shot. The photo was taken on 16/07/2018 and it was uploaded on this page on 16/07/2018. 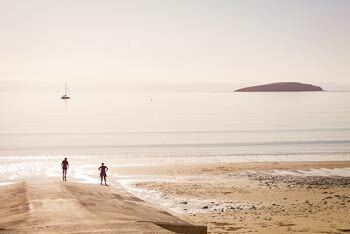 The incredible summer continues here in Abersoch with clear blue skies and strong sunshine for Sunday morning. John captured this low tide shot looking from the inner harbour across to the headland where the White House Hotel used to stand. The photo was taken on 08/07/2018 and it was uploaded on this page on 08/07/2018. 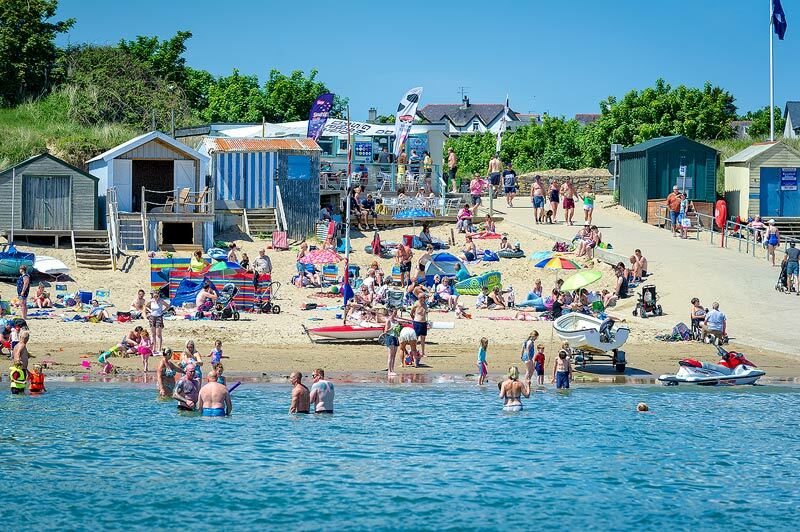 An incredible week of weather in Abersoch saw several days with temperatures reaching levels above 30C, which was potentially unprecedented in recent times. 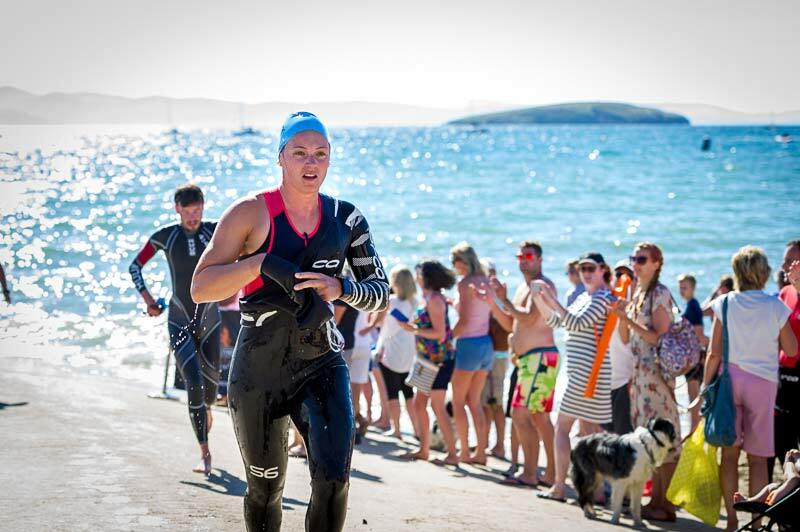 The hot conditions provided an extra challenge for the hundreds of triathletes who were racing in Abersoch this weekend. 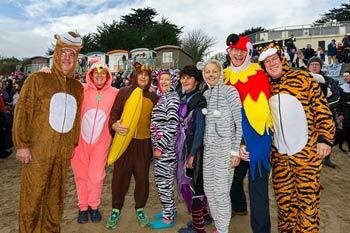 An early easterly breeze also made the bay choppy, adding an extra challenge for the swin legs of the races. The photo was taken on 30/06/2018 and it was uploaded on this page on 01/07/2018. 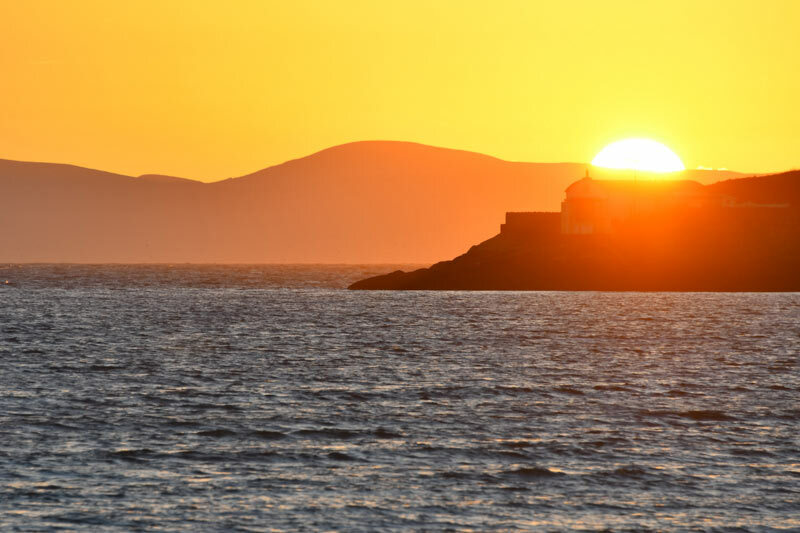 The summer weather has returned and after a beautiful weekend, Monday dawned like this, captured by John at 5.30am this morning on what is set to be a fantastic beach weather day, with more on the way during the rest of this week! The photo was taken on 25/06/2018 and it was uploaded on this page on 25/06/2018. 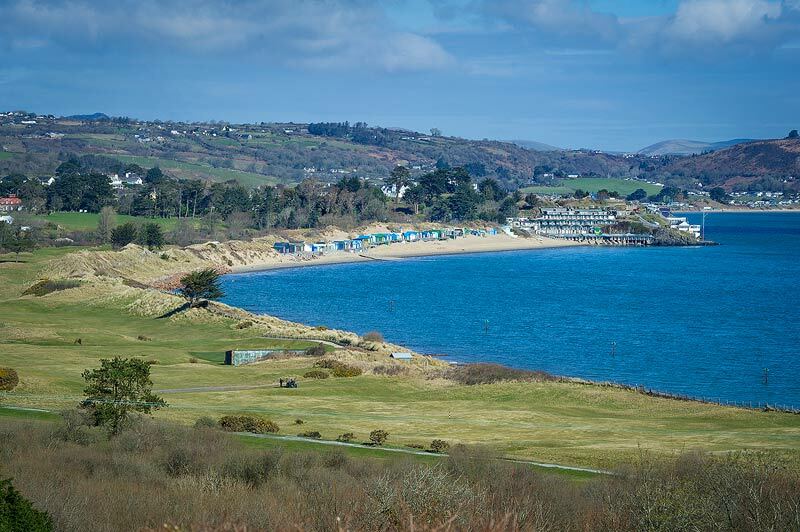 Changeable weather conditions have returned to Abersoch and Pen Llyn after the warm, continental influenced weather of recent weeks. 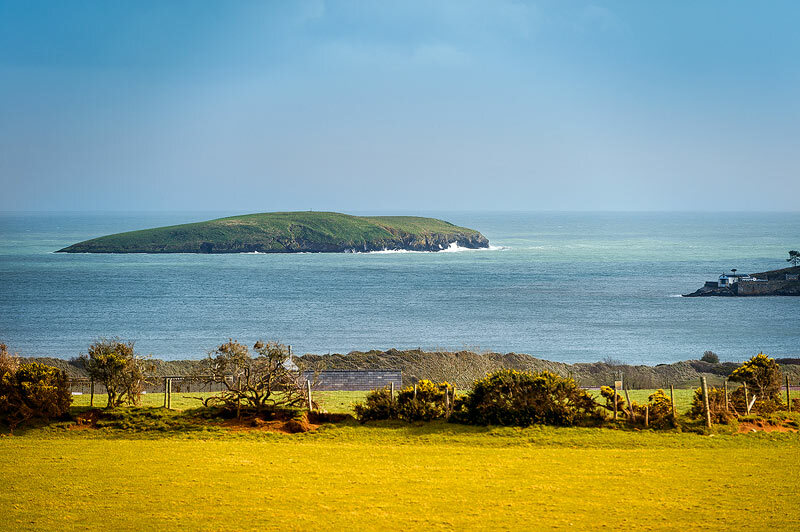 However, despite the weather now coming from an Atlantic source, lovely periods can still come and go and this afternoon is a classic example of that, with some pleasant sunshine arriving after the Saturday morning rain, captured by the lens of John Wormald. The photo was taken on 16/06/2018 and it was uploaded on this page on 16/06/2018. 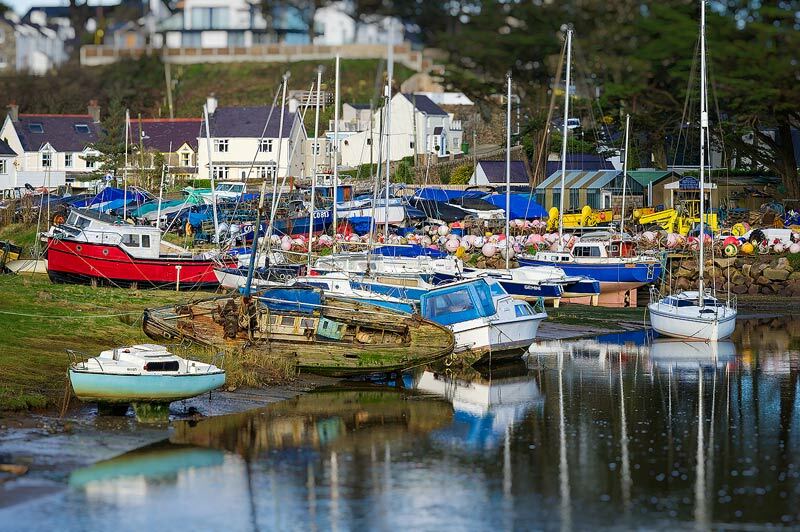 The really warm, continental style weather has continued since our last photo update from John, but rather than a sizzling beach shot, we have something a little different this week, with a shot looking across the inner harbour. It shows the new Riverside housing development, which is also the new home for Phill's Abersoch Watersports, with the McGill and Lloyd-Jones boatyards in the foreground. The photo was taken on 10/06/2018 and it was uploaded on this page on 08/06/2018. 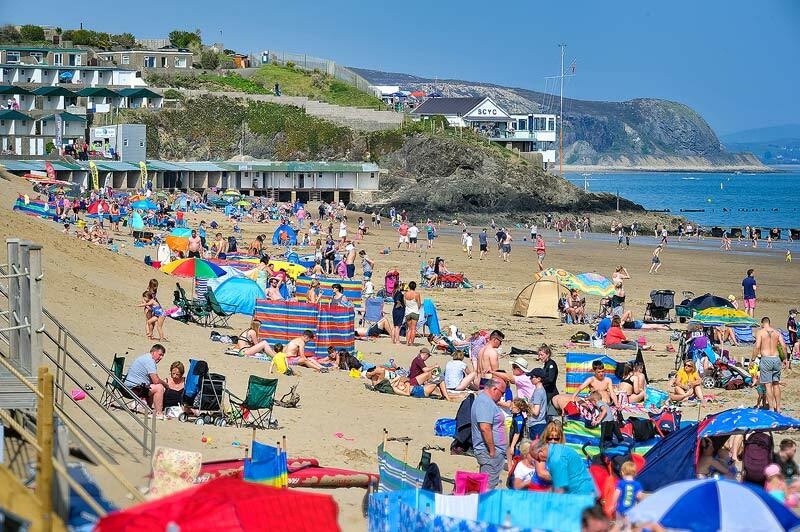 June has started with some glorious weather, which has coincided with the half term holidays and the holiday week ended with another beach weather day on Sunday. John took this shot from the water looking towards the golf slip and beach cafe. The photo was taken on 03/06/2018 and it was uploaded on this page on 04/06/2018. 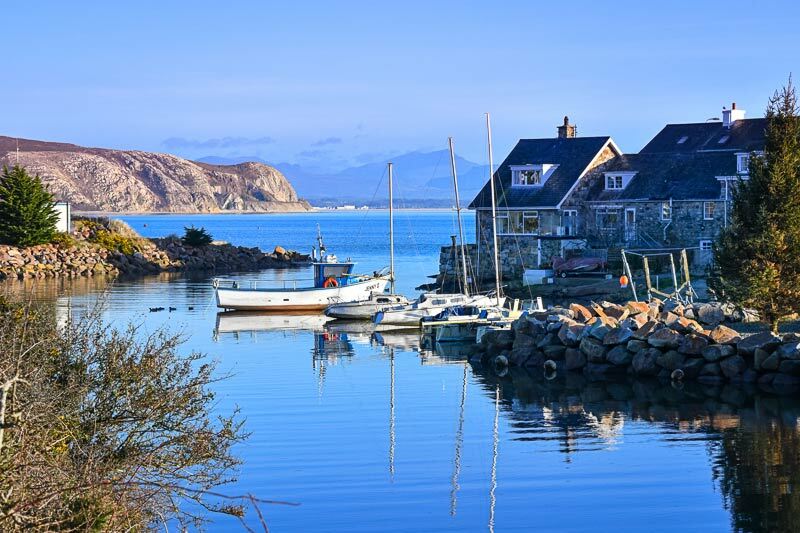 After a few days of disappointing weather, the blue skies have returned to Abersoch for John's photo this week, taken from near to the outer harbour slipway. 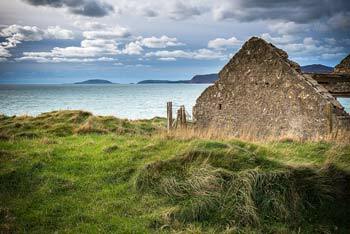 The repaired sea defences can be seen in the distance. The photo was taken on 28/05/2018 and it was uploaded on this page on 28/05/2018. The last week has seen some great weather here in Abersoch, with plenty of dry and bright weather with some really classic days mixed in. 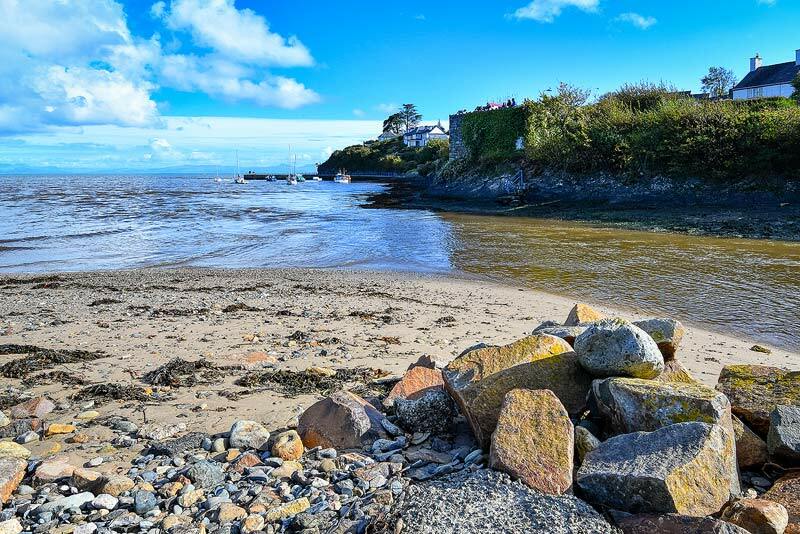 This photo is taken of the outer harbour and harbour beach area of Abersoch, with the jetty providing ample protection for the boats anchored within. 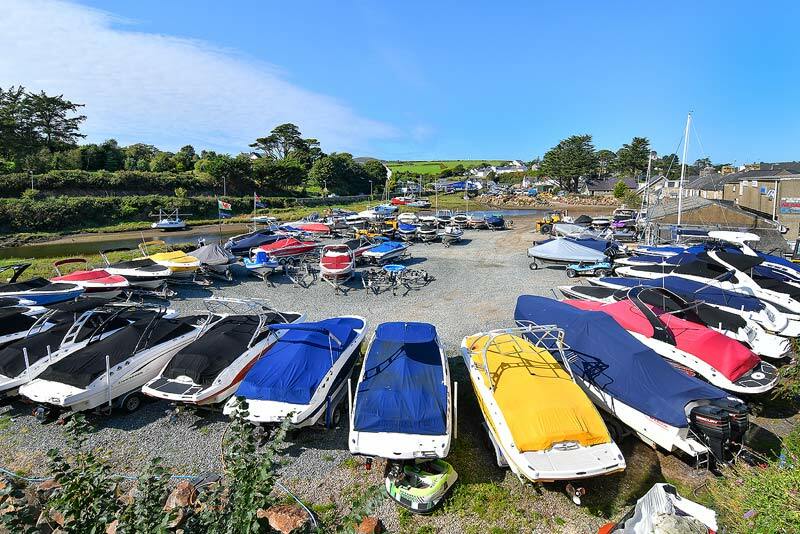 Note that the deep water moorings in the bay are seeing boats return again for the season, as yachts are brought out of hibernation and returned to their summer home. The photo was taken on 14/05/2018 and it was uploaded on this page on 20/05/2018. A stunning sunrise this morning captured by John, looking across Abersoch inner harbour and looking towards the mountains of Snowdonia. The photo was taken on 13/05/2018 and it was uploaded on this page on 13/05/2018. 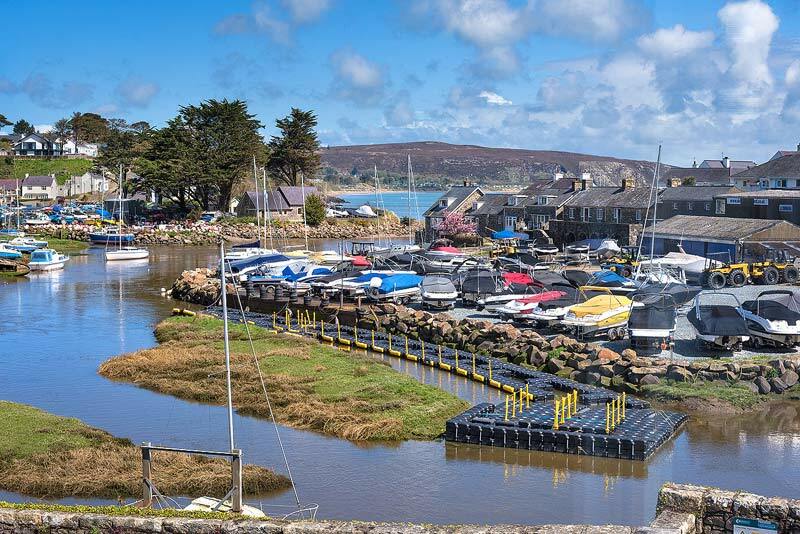 There has been some sunshine in the last week and John took this shot of Abersoch Inner Harbour from the Riverside hosing development, the site of the old Riverside Hotel. 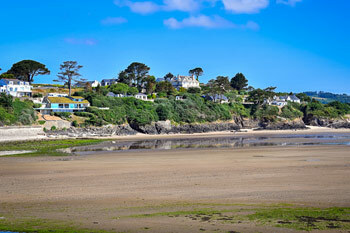 The hotel was one of several landmark buildings that have been replaced by holiday housing in recent years. The pontoon in the foreground of the photo is the floating one that will go out to St. Tudwal's West Island during the summer. The photo was taken on 02/05/2018 and it was uploaded on this page on 05/05/2018. A view looking across Llanbedrog Beach is this week's photo from John. Winter storms leading to scouring of the beach, exposed an old refuse tip on this beach and the painstaking clean up work on the contaminated sand has been completed this week. The photo was taken on 25/04/2018 and it was uploaded on this page on 29/04/2018. 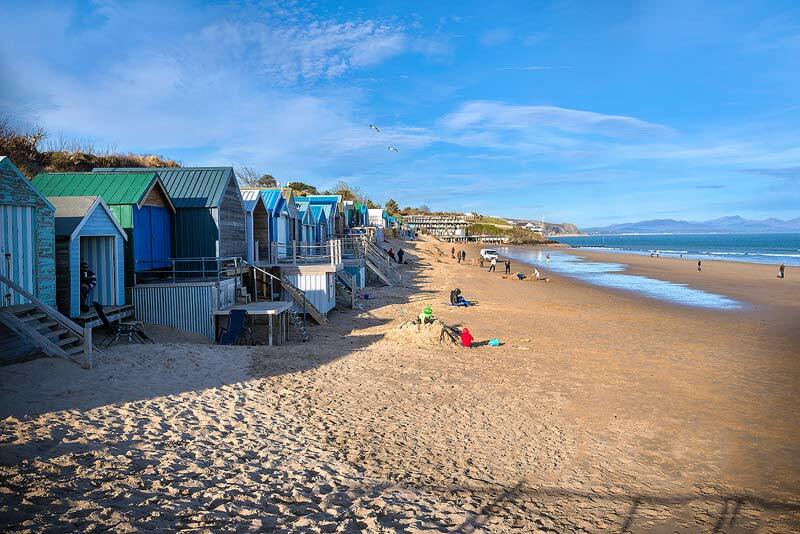 Another sunny photo this week from John as Abersoch finally joins in with the fine and warm spell that other parts of the UK have been seeing this week. 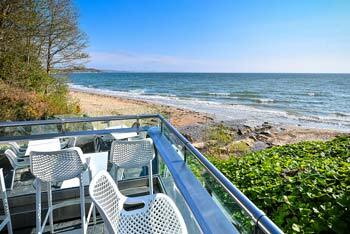 Today, that combination of a lack of wind and warm sunshine has sent tempertures into the high teens C and it looks as though this is the best day of 2018 so far. 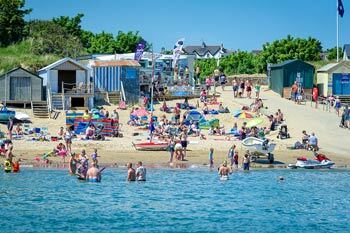 You can keep track of the latest Abersoch weather over on our forecast page. The photo was taken on 21/04/2018 and it was uploaded on this page on 21/04/2018. 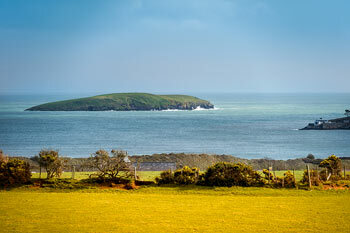 The sunshine has come out for the middle Saturday in April, as captured by John today. 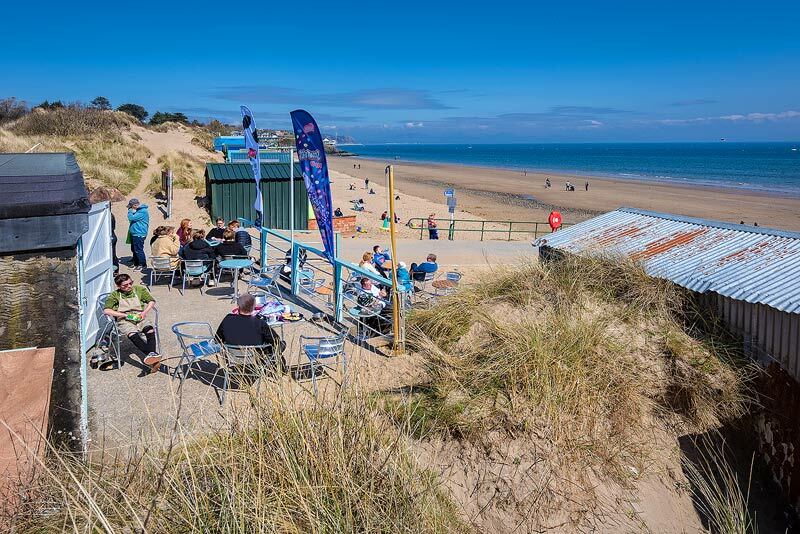 The big question is whether Abersoch will see the heat this week that is expected in parts of the UK, with perhaps the second half of the week seeing some summer-like conditions arriving after a very windy and changeable period starting tomorrow. 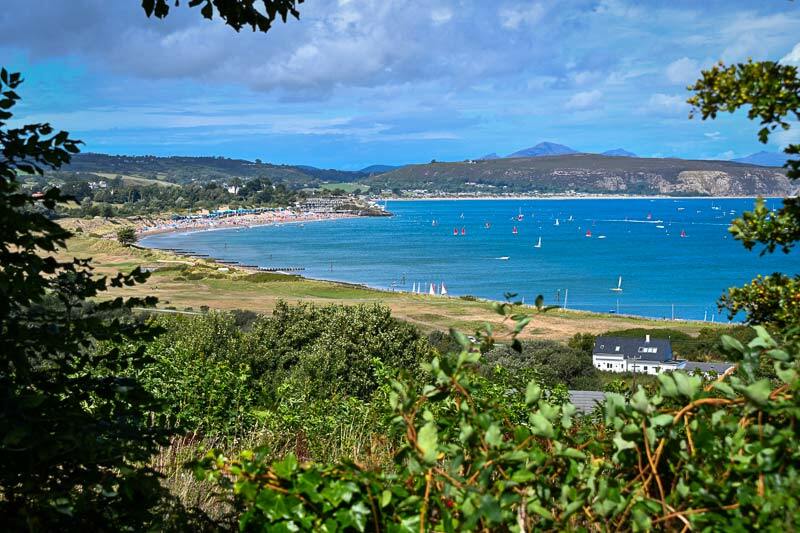 You can keep track of the latest Abersoch weather over on our forecast page. The photo was taken on 14/04/2018 and it was uploaded on this page on 14/04/2018. At this time of year, when the sea is still cold, the weather can still feel very warm here in Abersoch with the magic ingredients required being sunshine and a lack of breeze. 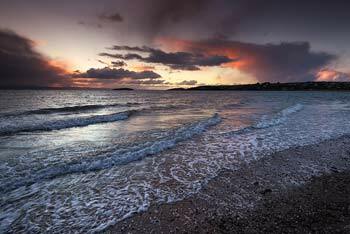 Once that breeze drops out, we lose the cooling influence of the seas that surround the peninsula, with a local warming effect taking place. This happened for a time on the 5th April and John was on hand to capture the glassy bay and the lone yacht out in the bay. The photo was taken on 05/04/2018 and it was uploaded on this page on 08/04/2018. 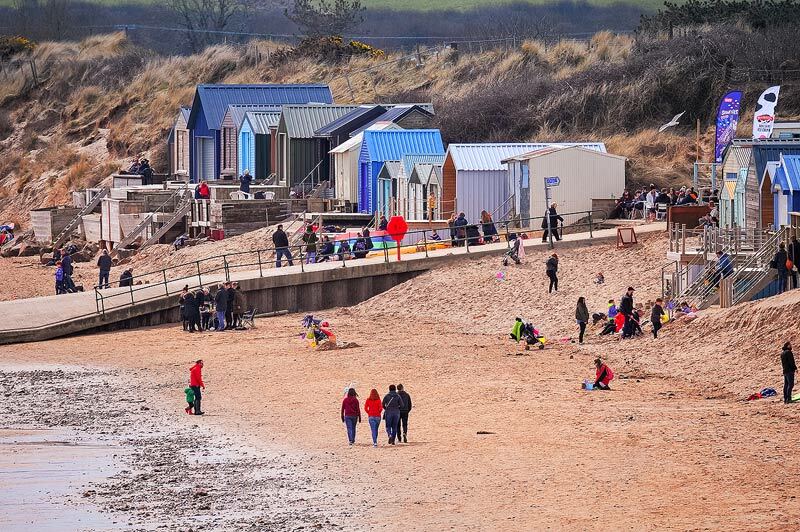 It is not the warmest of Easter Sunday's however, there were plenty of people enjoying the fresh air down on the main beach in Abersoch today - as captured by John this afternoon. The photo was taken on 01/04/2018 and it was uploaded on this page on 01/04/2018. 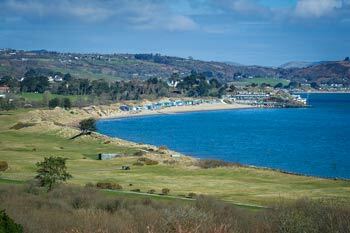 A view this week across the famous links of Abersoch golf course, with the main beach and yacht club in the distance. The photo was taken on 20/03/2018 and it was uploaded on this page on 24/03/2018. 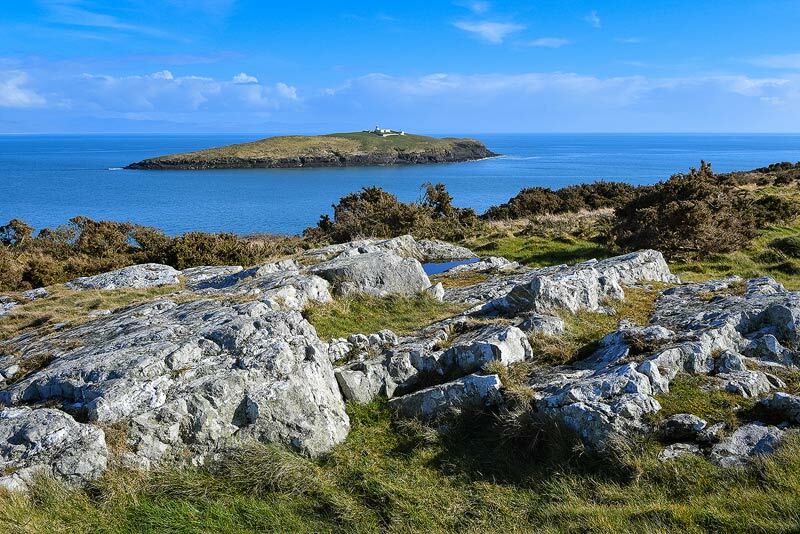 Spring is trying to make an appearance and John captured this lovely shot from the coastal path, before the easterly winds returned a day later and brought a return of winter to Pen Llyn. The photo was taken on 16/03/2018 and it was uploaded on this page on 17/03/2018. This stunning photo was taken by John early in the morning of the surprise snowfall event of Thursday. 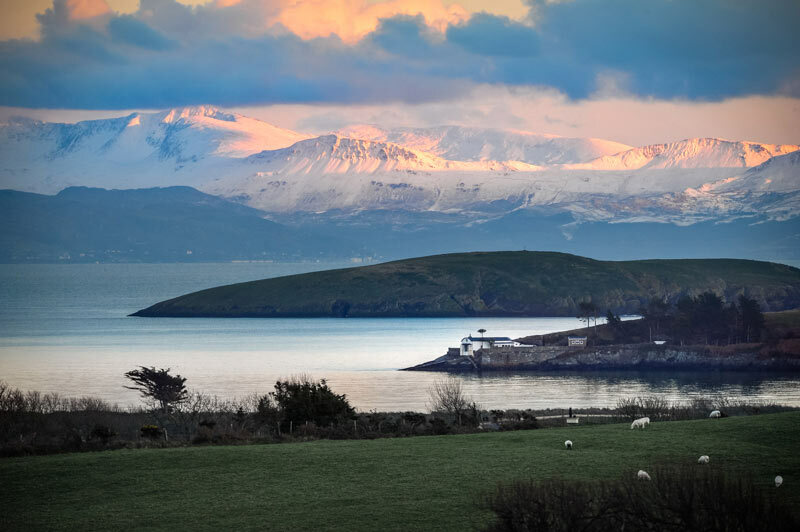 2 memorable snowfalls in a week for Pen Llyn! The photo was taken on 08/03/2018 and it was uploaded on this page on 09/03/2018. 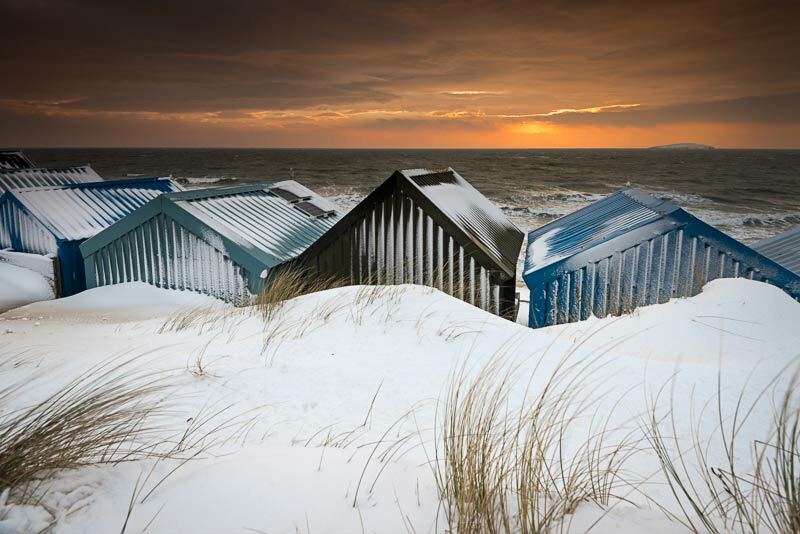 Beach huts at first light are the theme of this week's photo from John, however, under very different circumstances to the one that we posted last week... the morning after the heaviest snowfall in the area for 35 years, brought by the latter stages of Storm Emma that battered the bay and coast with severe easterly gales, bringing a very rare ice storm, followed by a blizzard. Incredible weather! The photo was taken on 03/03/2018 and it was uploaded on this page on 04/03/2018. 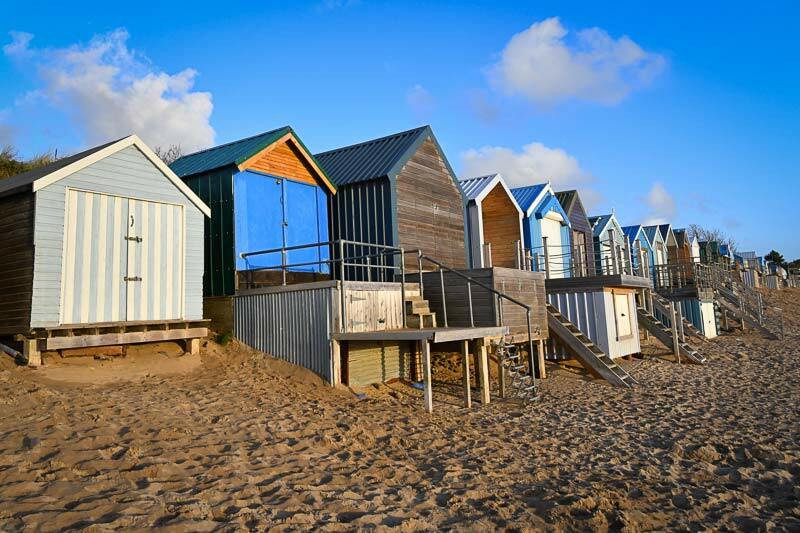 The beach huts on Abersoch main beach, bathed in the light from a winter's sunrise are the subject of John's lens this week. A lovely photo! The photo was taken on 24/02/2018 and it was uploaded on this page on 24/02/2018. 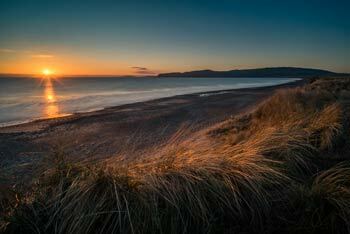 This fabulous winter sunrise photo was taken by John from the Warren beach. St. Tudwal's Islands are visible in the distance. 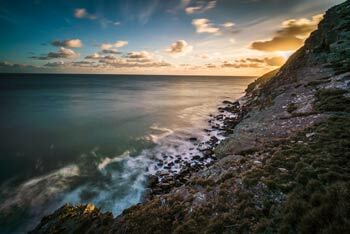 The photo was taken on 16/02/2018 and it was uploaded on this page on 17/02/2018. John is away this week and so we have Phill Boyd as our guest contributor, who has taken this stunning shot on the coastal path around Cilan head. 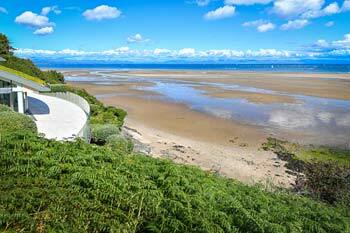 The coastal path really is a wonderful local resource and is highly recommended! The photo was taken on 09/02/2018 and it was uploaded on this page on 10/02/2018. A cold February morning in Abersoch, but with some fine weather, has allowed John to get this lovely shot looking across the bay towards St. Tudwal's Islands, from the Quarry end of the Warren beach, just to the north of Abersoch. The photo was taken on 04/02/2018 and it was uploaded on this page on 04/02/2018. 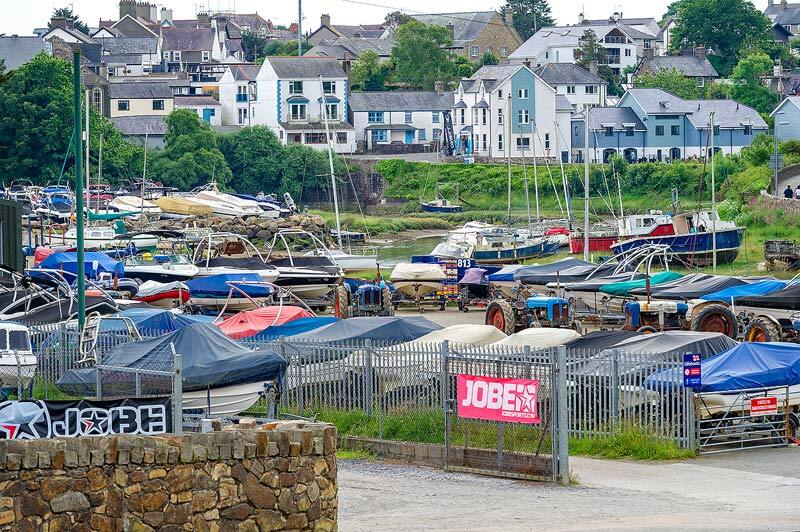 A photo looking across Abersoch's inner harbour and the boatyards of Owi Lloyd Jones and Neil McGill, is this weeks photo from John. 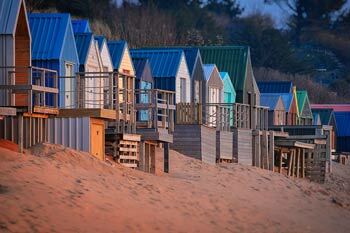 If you look carefully at this shot, the houses in the background look like little model houses! The photo was taken on 26/01/2018 and it was uploaded on this page on 29/01/2018. 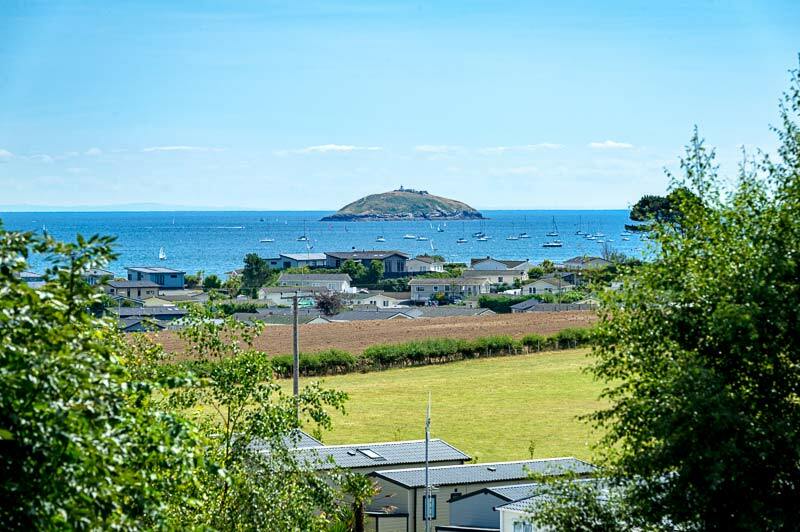 John is back for this week's photo with a view across to St. Tudwal's Islands from just above the main beach of Abersoch. 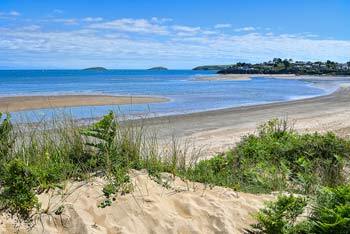 It won't be too long before this view of the empty seas are once again replaced with the spectacle of boats and yachts, windsurfers and paddleboarders. The photo was taken on 18/01/2018 and it was uploaded on this page on 21/01/2018. 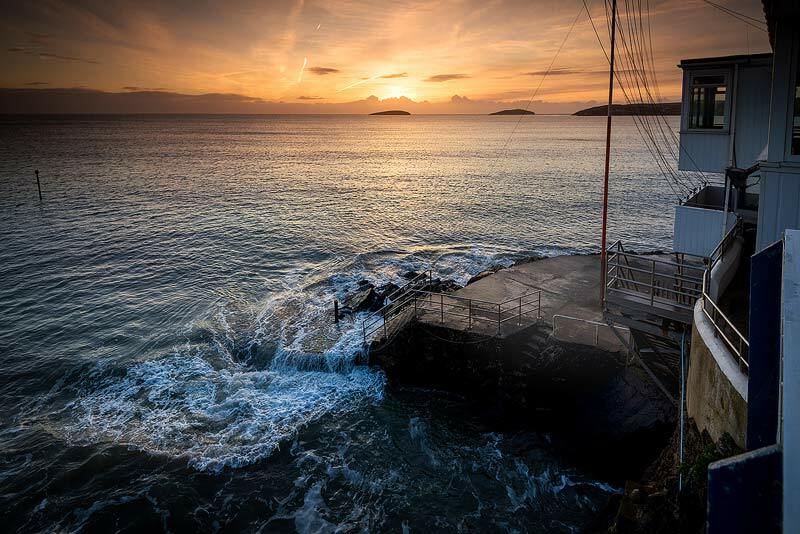 John is away this week, so it is Phill Boyd who is standing in for him and who has provided this lovely shot of a Porth Neigwl sunset from last week. The photo was taken on 09/01/2018 and it was uploaded on this page on 14/01/2018. 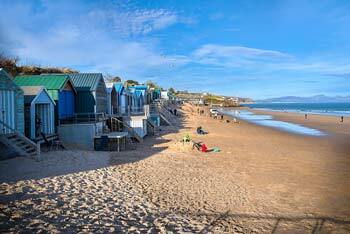 The beach huts on Abersoch main beach with some welcome January blue skies were the subect of John's lens this week. Nice to see some sunshine after the a spell of winter storms. The photo was taken on 07/01/2018 and it was uploaded on this page on 07/01/2018.